We’d love your help. Let us know what’s wrong with this preview of Flowers in Salt by Sharon Sievers. This is the first book to examine the changing roles of women in Japan during the four decades following the Meiji Restoration of 1868, a period of sweeping political, social, and economic change. The book concentrates on those Japanese women who were outspoken critics of their society and the roles women were assigned in it, but also assesses the contributions women made This is the first book to examine the changing roles of women in Japan during the four decades following the Meiji Restoration of 1868, a period of sweeping political, social, and economic change. The book concentrates on those Japanese women who were outspoken critics of their society and the roles women were assigned in it, but also assesses the contributions women made to Japan during a period of rapid modernization. The struggle of Japanese women to gain political rights, the creation of a women's reform movement, the involvement of women in the early socialistic movement, the protests of women textile workers who staged Japan's first strikes, the evolution of the women's movement into a literary movement, and a new view of Kanno Suga, an anarchist who was hanged by the Japanese government in 1911, are presented against the background of determined state intervention in the lives of women. The book concludes with a brief summary of the changing role of women in Japan since Meiji, and compares their experience with that of European and American women. To ask other readers questions about Flowers in Salt, please sign up. 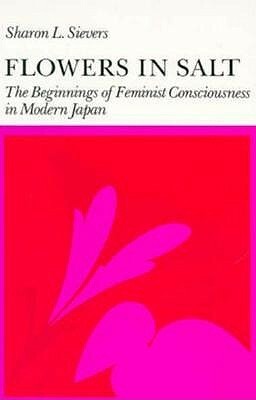 I found out about this book via my perusal of a bibliography of another book on women in Japan which I had read. I am glad I was able to get it via my local public library because it was quite well done. Sievers did a great job of weaving the political and social history of Japan from the mid 19th century into the first two decades of the 20th with interesting depictions of individual women who struggled to gain the freedom and rights that (a small number of) men had in the country. Despite ther I found out about this book via my perusal of a bibliography of another book on women in Japan which I had read. I am glad I was able to get it via my local public library because it was quite well done. Sievers did a great job of weaving the political and social history of Japan from the mid 19th century into the first two decades of the 20th with interesting depictions of individual women who struggled to gain the freedom and rights that (a small number of) men had in the country. Despite there being lots of info to cover she managed to do this in a style that was highly readable and, for the most part, quite interesting. Her wish to be thorough meant that there were a lot of women and their individual lives and struggles to try to keep track of. So, it got a bit challenging in that respect. But I came away with some valuable knowledge and a lot more respect, if not admiration, for the heroic efforts these women made in those days to carve out a legitimate place for themselves in Japanese society. Some of them sadly ended up in prison or dead, in fact. I was so impressed with Siever's work that I looked to see what else she might have published. Unfortunately, it appears as if this is the only book she wrote before she passed away a few years ago. It is a small (less than 200 pages, in fact) but nonetheless important legacy. Interesting research on the rise of feminism during the Meji era. Sievers writes about the past and the treatment of women throughout Japanese history (merely acting as "borrowed wombs") and their slow rise to recognition. Though there is still much work to be done regarding this subject world-wide, Sievers writes a commanding account of the problems and issues at the time, as well as the inherent root of the cause that lays within Confucianism. I would give this book 5 stars, but I had to take a star (and maybe a star and a half?) off for inaccuracies. "After a secret trial, conducted with great dispatch, twelve socialists, including Koutoku Shuusui and Kanno Suga were hanged." Kanno Suga was an anarchist, not a socialist and the "High Treason Incident" was a case of primarily anarchists being hanged. Sievers also mislabels Osugi Sakae as a Socialist. I am providi I would give this book 5 stars, but I had to take a star (and maybe a star and a half?) off for inaccuracies. Kanno Suga was an anarchist, not a socialist and the "High Treason Incident" was a case of primarily anarchists being hanged. Sievers also mislabels Osugi Sakae as a Socialist. I am providing a link to a Wikipedia article about the High Treason incident. Further Helene Bowen Raddeker's book "Treacherous Women of Imperial Japan" discusses Kanno Suga at length. Given that Wikipedia and the Internet did not exist when Sievers wrote her book, it means she had to do legwork on this book in a way that we youngun's of today probably can't really understand. Further, I've said elsewhere that inaccuracies and errors are, unfortunately, unavoidable to some degree in all scholarship for a variety of different reasons. However in each instance when I discover an error in a book I wonder--what other errors are there that I DIDN'T catch because I'm not super familiar with the topic? I also wonder what are the *reasons* for the errors? Did Sievers have inaccurate information available to her? Did she misinterpret the available information? Does she not understand the difference between "anarchist" and "socialist"? Or does she, for some reason, have a commitment or interest in the word "socialist" that causes her to skew some bits of history? While I enjoyed the book, I obviously have reservations about trusting the information contained inside it. Yet at the same time I am sympathetic to how hard it is to be one of the forerunners of research on a topic where information is very difficult to get in English (or even in Japanese!!). Other points of confusion for me: this author claims that Itou Noe was anti-abortion. This is possible, for sure. Anything is possible. But Itou Noe was Japan's first Anarcha-feminist, heavily inspired by Nietzsche and Stirner. She was in a relationship with Tsuji Jun (an anarchist, feminist, surrealist, playwright and translator of "The Ego and It's Own") for a brief time. It's hard for me to imagine Itou Noe as being "Anti-Abortion", especially for the stated reason of her being "opposed to anything unnatural". Again--people are complicated, so people CAN hold contradictory ideas but this particular idea is hard to square with all other known facts I've heard, seen, and read about Noe. A very interesting intro, though it skips between general history and biography in a slightly uninteresting way. Sievers gets mad props from me for putting this attempt together. The writing is sympathetic, nuanced, and careful in a way that i really appreciate (considering the subject matter and the author's status). It would have been easy to screw this up. Kanna Suga (1906): "Rise up, women! Wake up! As in the struggle workers are engaged in against capitalists to break down the class system, our demands for freedom and equality with men will not be women easily just because we will it; they will not be won if we do not raise our voices, if no blood is shed." That is frickin' tough. I need to read more of her stuff. She seems to have bled righteousness. Siever's application of the idea that in anxious times of rapid social change, women are forces into the role of the keepers of tradition plays out very nicely here. This is an important book because it offers a corrective to so many histories of modern Japan in which men are the only actors. However, its analytic mode of "feminist consciousness" seems a little tired and outdated. Actually a really interesting "educational" book!